Happy Valentine’s Day. What does that even mean? The best excuse to play with chocolate. I love custards and puddings – tapioca or rice pudding, eclairs with custard filling, I recently mentioned to a friend that pot de cremes might be one of my favorite sweets. I grew up eating a lighter variation of a steamed gingery custard my mom would make during the cold season. However I tend to like custards that are lightly flavored, fragrant or fruity. So the first time that I tried this chocolate pudding I was a bit appalled by how dense, dark, and delicious it was. My friends know me for loving tiny portions in tiny cups…but spoon after tiny spoon after tiny spoon of this stuff and I kept returning. It’s even better with a huge dollop of unsweetened whipped cream and a tart citrus curd on top! Sorry I’m behind with updating my blog and backlogged for the next week’s treat. Here’s a hint of what’s to come! I demand the recipe for the pudding. Is it the five minute mousse? I think not. nope. 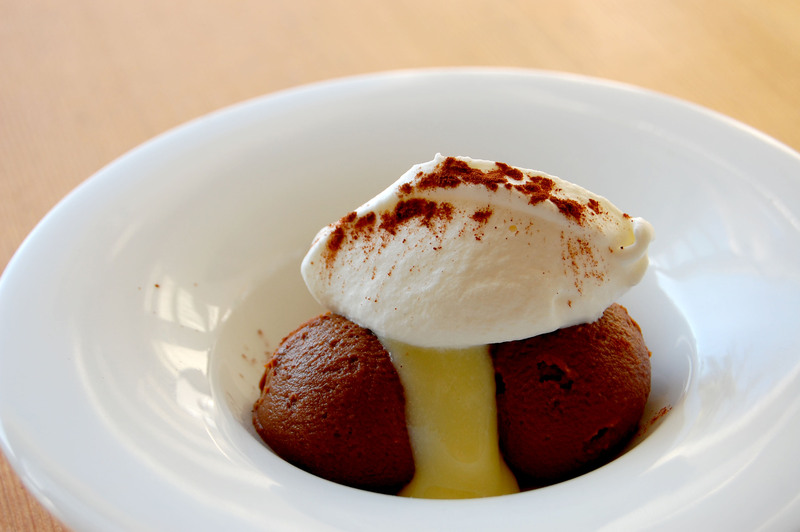 not 5 min mousse, this one involves eggs, chocolate, milk, cream, cocoa, sugar & cornstarch. i’ll send it over!